You know I had just been thinking that the Wii didn’t have enough games on it that appealed to children. You know the kind of game where on every other system the game looks cool and realistic, but on the Wii everyone has been given a big head and cartoonish looks. 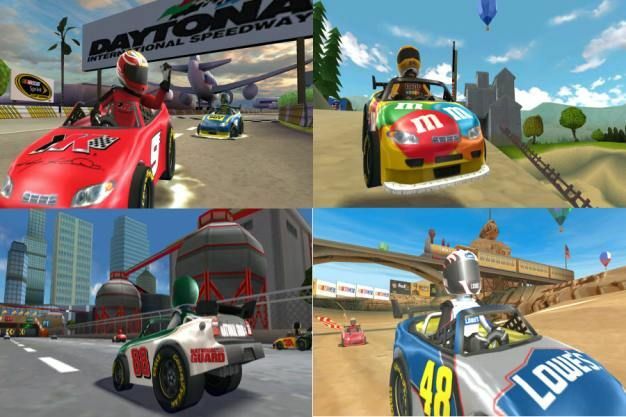 Well have no fear because EA is bringing us NASCAR Kart Racing, the only NASCAR game on the Wii, on Feb. 10, 2009. You’ll get to race as all your favorite drivers, but they’ll look funny and be in kart version of their cars. I hate NASCAR to the bottom of my very soul, but if I had to choose between real NASCAR and cartoon NASCAR I’d go real any day. Come on, the Wii is built for a solid NASCAR game, but heaven forbid developers try to appeal to anyone else but those who have fallen in love with Mario Kart. As if that weren’t enough the game is clearly looking like another Mii-rip-off art style. At least Shaun White Snowboarding: Road Trip aimed for a different look. Boo and hiss.